Outdoor lighting represents one of the most dynamic and uplifting ways to improve the appearance, safety, and usability of a home or business during the darker hours of the day. It can bring out the best aspects of architecture and landscaping to highlight the hard work that has been put into a property. The proof of an excellent property resides, at least partially, in how awe-inspiring the landscape lighting is. It is what separates an above average property from the cream of the crop. What Does Landscape Lighting Do? The most revealing part of landscape lighting installation is the fact that it accomplishes several goals besides simply providing light to the property. Adding Security – Visibility at night reduces the likelihood that criminals, animals, and other dangers will be present. If they are, they can be noticed before a person is put in danger. Aiding in Safety – Guests and residents can see better when a property is properly illuminated at night. They can avoid branches, landscape fixtures and other things that could create unwitting hazards. Creating Atmosphere – Outdoor lighting, when done properly, will create an awe-striking ambiance that sets the right mood for a property during the evening hours. Facilitating Function – Illumination during the night allows a property to be used no matter what hour it is, which in turn drastically improves the value of the property to residents and guests. 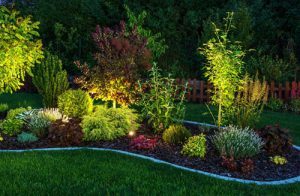 Savings on Electricity Usage – When designed by a professional company such as Boulder Falls Landscape, landscape lighting should be incredibly efficient on energy usage. LEDs and smart design techniques will reduce the amount of electricity needed to produce the right effects. One thing to understand about outdoor lighting is that it is a unique product of the individuals who install it. No two solutions are the same, and fewer are alike. Boulder Falls Landscape excels at providing our customers with lighting solutions designed to be effective, safe and easy-to-use. We can install automated systems that switch on when the sun goes down, work on a timer or allow individuals to manually turn on lighting. To learn more about our landscape lighting services, call Boulder Falls today.